THIS IS A FABULOUS PROMOTION FROM ONE OF OUR FAVORITE VENDORS!! 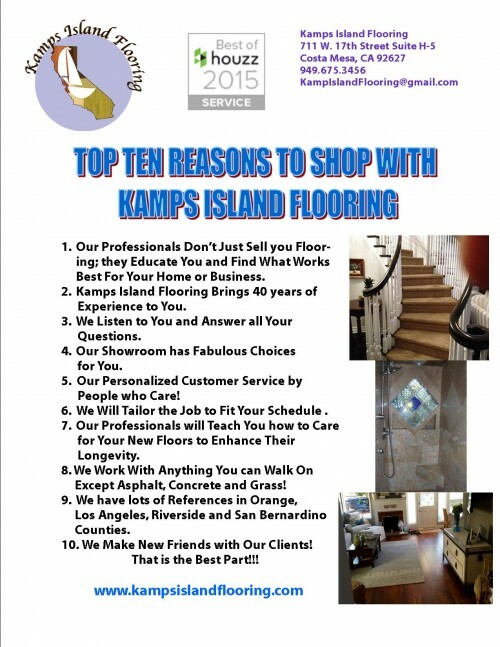 COME TO OUR SHOWROOM and SEE!!! Saturday May 30, 2015	Balboa Island Wine Walk See Flyer inside this Issue for all the details. http://www.BalboaIslandWineWalk.com for tickets! We are all going to get a break from the Orange County Sanitation District project on Coast Highway. When? . . you ask. This summer!! The turmoil we have been going through is Phase One of a Two Phase project. 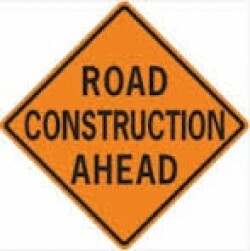 All traffic lanes are planned to be restored by Friday May 22 for Memorial Day!!! Hurrah!! This important project is replacing 70 year old pipes that take sewage from Newport Beach to Huntington Beach for processing. There have been several delays including the cutting of gas lines twice, the cutting of power to a traffic signal and the discovery of wood and concrete left from either a 100-year old train system or a bridge. Phase two will start in September and the project should finish by the end of the year! One of my good friends from Balboa Island said she was in a local department store a few years ago. She started speaking to the sales woman who discovered my friend was from Balboa Balboa Island. I, too loved Shanghai Pine Garden and am glad it is still here—even in a slightly new form. The building itself is owned by Wing Lam of Wahoo’s Fish Taco fame. We are very fortunate that Wing feels nostalgic about Shanghai Pine Garden. His parents owned the restaurant and he grew up there (back in the duck days). When the former owners left, Wing decided to keep the same format and not to bring a Wahoo’s to Balboa Island. We love the people and the food of Picante Martin’s—one great taco restaurant is just perfect on our little street! Spring is here! Time for a visit to longtime Island favorite “Persimmon Tree”. I dropped in and spoke with owner ‘Pam’ who took me on a preview tour of Spring/Summer Swimwear and related accessories. You have to check out the ‘Tommy Bahama’ Swimwear Collection - dreamy Tankini’s and 1-Piece suits starting @60.00! Great Cover-Ups, featuring signature prints! And for the sun - Pam highly recommends their exclusive ’Sun Bum’ ALL Natural Skincare/Sunblock line. “This very popular brand flies off the shelf”. Get in & get your supply ASAP! Island Paddle Board Rentals are at Persimmon Tree - great fun for the entire family - boards may be Rented out by the WEEK including Delivery! They cater to larger groups too. A big plus when you’re toting around family & friends - up to 40 boards!!! For those of you who haven’t heard, the ever-popular Coffee-Shop chain “Coco’s & Carrow’s” restaurants have been bought out by a Texas-Based food Co. Many have had to shut their doors overnight all along the coast from San Diego to points North. 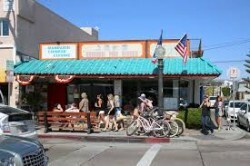 Long time patrons here in Newport Beach were saddened to lose 2 locations in the past few years. GOOD to know: I have it on strict word from the manager of Coco’s at @900 N. Bristol that it WILL remain open for business and is not included in this massive ‘sweep’ of closures. 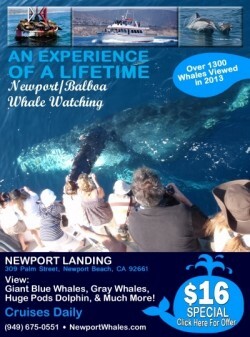 NEWPORT WHALE WATCHING. . . . . In the Fun Zone—next to the Balboa Island Ferry! GENERAL HOME REPAIR—Electrical, Carpentry including (termite/wood rot, rough/finish, fence/gate repair), plumbing, concrete, general clean up/hauling and demo. Living in Istanbul, Turkey, Gerda Ergul always dreamed of coming to America. In 2014 Gerda and her family rented a house in Ladera Ranch for a vacation month. Her girlfriend from Turkey had moved there with her American husband and loved California. Gerda, Harun and their son 13 year old Tibet, loved it too! They started looking at schools and Tibet was immediately accepted because he is fluent in English. Tibet started school in August and will return to Turkey for the first time after school is out in June. And that was just the beginning. Walking around Balboa Island, Gerda fell in love with our Island and fell into a business opportunity when the owner of Island Pilates decided to sell. She loved the décor—the employees—and the location. The decision was easy!! Gerda was originally a championship runner in Albania. She has been in the fitness industry for 23 years! Gerda incurred injuries from her running and overuse of various muscles and body parts. That is what brought her to Pilates. After she was healed she trained at ‘Pilates on Fifth Avenue’ in New York City and then moved to Turkey where she met her husband and opened a Pilates studio. She and Harun built the business into three large Pilates studios for upscale residents of Istanbul. Gerda also filmed many, many YouTube videos available for free for stay at home mothers in Turkey. They are professional, beautiful and reflect Gerda’s energy and enthusiasm! Even though they are all in Turkish I love them! Google “Gerda Pilates” and see for yourself. Gerda specializes in Pilates for Golfers, Jungle Sports Sling Training and Special Conditioning for Seniors and those with Injuries. My good friend Shawn Mastos works at Gerda Pilates teaching Yoga Classes. Gerda is Having a Grand Opening in conjunction with the Balboa Island Wine Walk on Saturday May 30!!! There will be a reception center for the Wine Walk in the Courtyard in front of her business! What are a cooks two favorite Flowers? What Flower is best seen with the naked eye? What type of Flowers do you find at a car dealership?